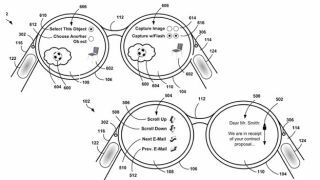 The last time Google's Project Glass AR specs appeared in the wild, they were rocking a rim-mounted physical trackpad, for which Google now owns the patent. In late May, Sergey Brin demonstrated the newest prototype on the Gavin Newsom Show, using the trackpad to navigate the UI and locate a photo taken on his Android smartphone just moments earlier. In the patent filing, which Google applied for days before showing off the tech, the company describes the trackpad as a "finger-tracking input sensor". The diagram above showcases how the trackpad can be used to take photos, or scroll through emails using directional movements and pushes. The filing to the USPTO says: "In another embodiment, the input device may include a touch-sensitive pad configured to sense at least one of a position and movement of a finger along a planar direction relative to a surface of the input device via capacitive sensing, resistance sensing, and/or via a surface acoustic wave (SAW) process. "In yet another embodiment, the input device may be an optical imaging device and the surface of the optical imaging device a lens provided at an outer surface of the optical imaging device. By capturing images many times per second, the optical imaging device can accurately detect a position and movement of a finger along a planar direction relative to the lens surface of the input device." Project Glass is a product of the X Labs at Google and is still very much in the development stages. Latest hints suggest that the device could be released sometime in 2013. You can catch up with all of the latest happenings via our Project Glass: What you need to know feature.